During my years at the University of Michigan, I had a special disdain for the law school — not for the school itself, which I knew nothing about, but for the law school building. It was a Gothic heap, with tall windows, parapets, finials, turrets and buttresses, and and it seemed to be pretending to be older than it was. In my mind it was an affront to the egalitarianism of the post-Watergate, post-Vietnam 1970s. It was a visceral dislike. The law school was an emblem of a university that was self-satisfied and elitist, with almost sacred traditions to uphold — I never knew what to make of the obsession with the Wolverines football team, school colors, the fight song. If there had been zombies in those days I might have made such an analogy. What I wanted instead was a stew of people and ideas and passions, a place where we would focus on the new. You’d no longer get me to denounce the law school and all the rest as part of an Orwellian conspiracy to lure a generation into mindless conformity. Now I tend to think of it more as a marketing gimmick. That’s the point Robinson Mayer makes in his article “How Gothic Architecture took over the American College Campus,” in the Atlantic. Initially, American colleges were modest places and their hodgepodge of buildings reflected their identities as new, unassuming institutions. But by the end of the 19th century, Mayer writes, state governments were severely underfunding institutions of higher learning. And so they turned to donors and future students to maintain their long-term viability. “But why the Gothic?” he asks. 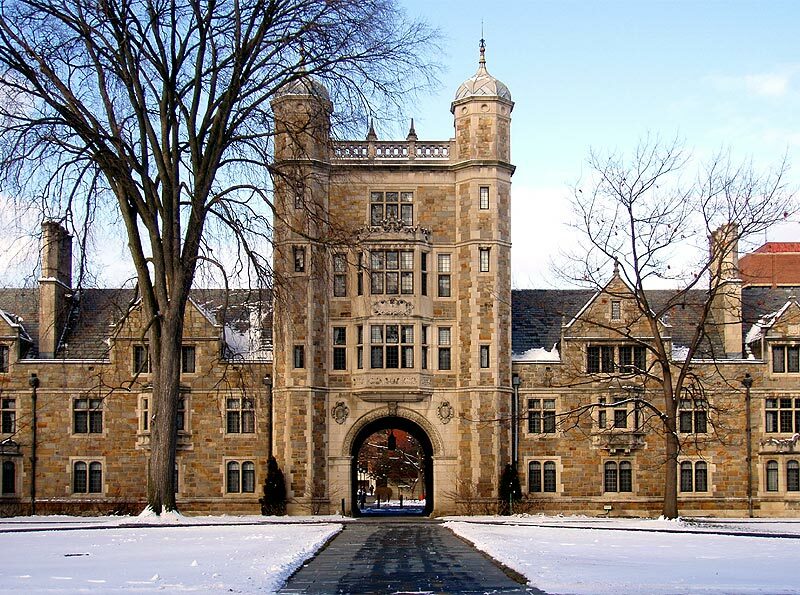 Mayer writes that American colleges sought to emulate Oxford and Cambridge (where the Monty Pythons went to school). So as they were seeking to reinvent themselves as old, the Collegiate Gothic style was born.